Thanks to Driffield Agricultural Society for the invitation, also my lovely stewards for their hard work and many thanks to all exhibiters for their entries. Nice tricolour, good head and eye, correct mouth, good bone, nice mover, needs time to develop. A promising young red and white, good head, mouth correct, used ears well, straight front with neat feet, moved well, needs time to mature. Brindle and white, good wide head with fill and strong muzzle, correct mouth, good ear placement and used to enhance his expression, strong neck on deep well rounded body, moved with drive. Quality balanced tricolour lovely head with gentle profile, short back and good on the move. Another quality dog, white with eye patch, good head, small dark well placed eye, correct bite, good bone and substance, deep well rounded body, short back, moved well. 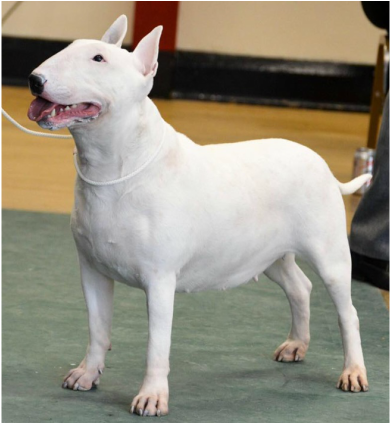 White with black ear, good head with width and fill, correct mouth, small dark well placed eye with keen look, short back with well sprung rib, decent mover. Quality pretty white with good head profile, dark well placed eye, correct mouth, good reach in neck, straight front, moved with drive and balance, just needs time to develop. Well made red and white with good well fill head and very nice profile, correct mouth, plenty of bone size and substance, well developed body, moved with drive. Attractive white, nice filled head, neat ears, correct bite, deep chest, nice tight feet, pleasing movement. Quality white, bridle ears, strong head with good profile and fill, mouth o.k. good bone, deep brisket well sprung rib, nice front, strong hind quarters, good on the move. Red and white in super condition, good head with nice gentle profile, good ear carriage, mouth good, clean front, level back, strong hind quarters, moved better coming. In proportion, feminine red and white, good length in head, lovely eye, neat erect ears, mouth good, strong long neck, rounded body, level topline, good front with neat tight feet, sound rear quarters, nice mover and good presentation. White with nice head, small dark well placed eye, used to enhance keen look, nice mover and well handled.